The new Callaway X Series Golf Stand Bag is another popular bag from the Callaway range, with its lightweight feel and design for comfort. The X Series is crafted with premium materials and technology to ensure the ultimate in durability, performance and style. The 6-way top is 8.5" in diameter with full length dividers and there are plenty of pockets for all your gear, five altogether, including a clothing pocket, ball pocket, drinks pocket and accessories pockets. For improved carrying comfort and balance, Callaway have used their ComfortTech double strap system and soft mesh hip pad, but should you want to use this bag on a cart it has cart friendly locking legs to ensure they stay in place when in transit. In addition, non-slip foot pads provide better stability when the bag is in the standing position. 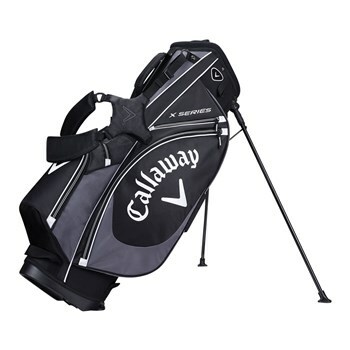 The Callaway X Series Stand Bag comes with a rain hood and also features an umbrella loop to store your umbrella when not in use and a towel ring so you can keep you towel handy during play. Weighing in at 2kg the Callaway X Series is an extremely well designed, functional bag which represents great value for money.